The FIFA World Cup, often simply called the World Cup, is an international association football competition contested by the senior men's national teams of the members of the Fédération Internationale de Football Association (FIFA), the sport's global governing body. The championship has been awarded every four years since the inaugural tournament in 1930, except in 1942 and 1946 when it was not held because of the Second World War. 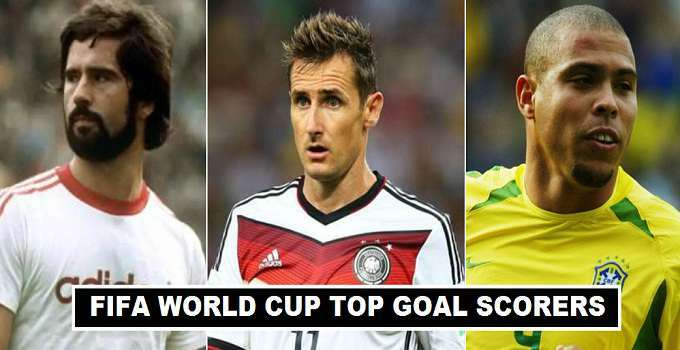 The current champion is Germany, which won its fourth title at the 2014 tournament in Brazil. The 20 World Cup tournaments have been won by eight national teams. Brazil have won five times, and they are the only team to have played in every tournament. The other World Cup winners are Germany and Italy, with four titles each; Argentina and inaugural winner Uruguay, with two titles each; and England, France and Spain, with one title each. The world's first international football match was a challenge match played in Glasgow in 1872 between Scotland and England, which ended in a 0–0 draw. The first international tournament, the inaugural edition of the British Home Championship, took place in 1884.As football grew in popularity in other parts of the world at the turn of the 20th century, it was held as a demonstration sport with no medals awarded at the 1900 and 1904 Summer Olympics (however, the IOC has retroactively upgraded their status to official events), and at the 1906 Intercalated Games. After the creation of the World Cup, FIFA and the IOC disagreed over the status of amateur players, and so football was dropped from the 1932 Summer Olympics. Olympic football returned at the 1936 Summer Olympics, but was now overshadowed by the more prestigious World Cup. The issues facing the early World Cup tournaments were the difficulties of intercontinental travel, and war. Few South American teams were willing to travel to Europe for the 1934 and all North and South American nations except Brazil and Cuba boycotted the 1938 tournament. Brazil was the only South American team to compete in both. The 1942 and 1946 competitions, which Germany and Brazil sought to host, were cancelled due to World War II and its aftermath. 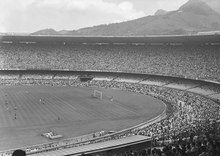 The opening game of the Maracanã Stadium, shortly before the 1950 FIFA World Cup. The 1950 World Cup, held in Brazil, was the first to include British participants. British teams withdrew from FIFA in 1920, partly out of unwillingness to play against the countries they had been at war with, and partly as a protest against foreign influence on football, but rejoined in 1946 following FIFA's invitation. The tournament also saw the return of 1930 champions Uruguay, who had boycotted the previous two World Cups. Uruguay won the tournament again after defeating the host nation Brazil, in the match called "Maracanazo" (Portuguese: Maracanaço). In October 2016 FIFA president Gianni Infantino stated his support for a 48-team World Cup in 2026. 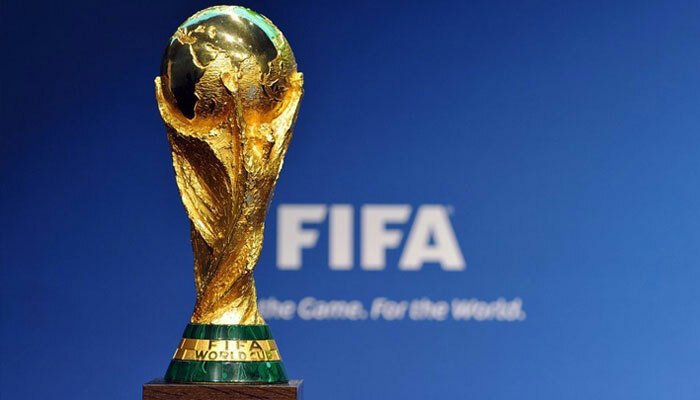 On 10 January 2017, FIFA confirmed the 2026 World Cup will have 48 finalist teams. By May 2015, the games were under a particularly dark cloud because of the 2015 FIFA corruption case, allegations and criminal charges of bribery, fraud and money laundering to corrupt the issuing of media and marketing rights (rigged bids) for FIFA games, with FIFA officials accused of taking bribes totaling more than $150 million over 24 years. In late May, the U.S. Justice Department announced a 47-count indictment with charges of racketeering, wire fraud and money laundering conspiracy against 14 people. Arrests of over a dozen FIFA officials were made since that time, particularly on May 29 and December 3. By the end of May 2015, a total of nine FIFA officials and five executives of sports and broadcasting markets had already been charged on corruption. At the time, FIFA president Sepp Blatter announced he would relinquish his position in February 2016. Since the 1958 FIFA World Cup, to avoid future boycotts or controversy, FIFA began a pattern of alternating the hosts between the Americas and Europe, which continued until the 1998 FIFA World Cup. The 2002 FIFA World Cup, hosted jointly by South Korea and Japan, was the first one held in Asia, and the only tournament with multiple hosts. South Africa became the first African nation to host the World Cup in 2010. The 2014 FIFA World Cup was hosted by Brazil, the first held in South America since Argentina 1978, and was the first occasion where consecutive World Cups were held outside Europe. The best-attended single match, shown in the last three columns, has been the final in half of the 20 World Cups as of 2014. Another match or matches drew more attendance than the final in 1930, 1938, 1958, 1962, 1970–1982, 1990 and 2006. The World Cup was first televised in 1954 and is now the most widely viewed and followed sporting event in the world. The cumulative audience of all matches of the 2006 World Cup is estimated to be 26.29 billion. 715.1 million individuals watched the final match of this tournament (a ninth of the entire population of the planet). The 2006 World Cup draw, which decided the distribution of teams into groups, was watched by 300 million viewers. The World Cup attracts many sponsors such as Coca-Cola, McDonald's and Adidas. For these companies and many more, being a sponsor strongly impacts their global brands. Host countries typically experience a multimillion-dollar revenue increase from the month-long event. The governing body of the sport, FIFA, generated $4.8 billion in revenue from the 2014 tournament. There was no official World Cup Third Place match in 1930; The United States and Yugoslavia lost in the semi-finals. FIFA now recognises the United States as the third-placed team and Yugoslavia as the fourth-placed team, using the overall records of the teams in the tournament. Austria withdrew after the draw as a result of the Anschluss with Germany: some Austrian players subsequently joined the German squad, leaving the tournament with 15 teams. There was no official World Cup final match in 1950. The tournament winner was decided by a final round-robin group contested by four teams (Uruguay, Brazil, Sweden, and Spain). Coincidentally, one of the last two matches of the tournament pitted the two top ranked teams against each other, with Uruguay's 2–1 victory over Brazil thus often being considered as the de facto final of the 1950 World Cup. Likewise, the game between the lowest ranked teams, played at the same time as Uruguay vs Brazil, can be considered equal to a Third Place match, with Sweden's 3–1 victory over Spain ensuring that they finished third. Only 13 teams played the 1950 FIFA World Cup.16 teams entered the seeding groups draw. However, Turkey and Scotland both withdrew before the draw; France (eliminated in qualifying) was invited as a replacement, leaving the tournament to be held with 15 teams. After the draw, India and France both withdrew, so only 13 teams participated in the tournament. In all, 77 nations have played in at least one World Cup. Of these, eight national teams have won the World Cup, and they have added stars to their badges, with each star representing a World Cup victory. (Uruguay, however, choose to display four stars on their badge, representing their two gold medals at the 1924 and 1928 Summer Olympics and their two World Cup titles in 1930 and 1950). With five titles, Brazil are the most successful World Cup team and also the only nation to have played in every World Cup (20) to date. Brazil were also the first team to win the World Cup for the third (1970), fourth (1994) and fifth (2002) time. Italy (1934 and 1938) and Brazil (1958 and 1962) are the only nations to have won consecutive titles. West Germany (1982–1990) and Brazil (1994–2002) are the only nations to appear in three consecutive World Cup finals. Germany has made the most top-four finishes (13), medals (12), as well as the most finals (8). Uzbekistani referee Ravshan Irmatov hold number of most refereed match in FIFA World Cup finals with 9 matches. He officiated two edition of World Cup at 2010 and 2014. He will oversaw some matches at 2018 FIFA World Cup.